Most predictions of future changes in the intensity of the greenhouse effect are based solely on changes in the CO2 content of the atmosphere. Their accuracy is therefore questionable, since CO2 is not the only greenhouse gas, nor is it the most powerful. 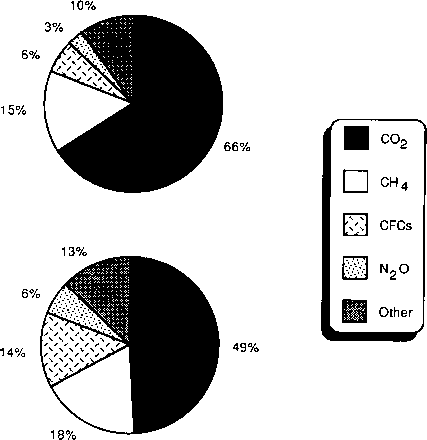 Methane (CH4), nitrous oxide (N2O) and the CFCs are the most important of the other greenhouse gases. Tropospheric ozone (O3) is also capable of enhancing the greenhouse effect, but its present concentrations are very variable in both time and place, and there is no clear indication of future trends (Bolle et al. 1986). 1990), although perhaps not by as much as was once thought (Houghton 1992). 1991). The disposal of organic waste in landfill sites, where it undergoes anaerobic decay, is also considered to be a potentially significant source of CH4. Attempts to provide accurate estimates of emissions, however, are hampered by the absence of appropriate data on the nature and amounts of organic waste involved (Bingemer and Crutzen 1987). The lifespan of CH4 in the atmosphere averages 10 years. It is removed by reaction with hydroxyl radicals (OH) which oxidize it to water vapour and CO2, both of which are greenhouse gases, but less potent than CH4 (Watson et al. 1990). Atmospheric OH levels are currently declining as a result of reactions with other anthropogenically produced gases such as carbon monoxide (CO), causing a reduction in the rate of removal of CH4 (Hengeveld 1991). The total impact of decreased concentrations is difficult to assess, but CH4 emissions into the atmosphere continue to grow, and it has been estimated that an immediate reduction in emissions of 15-20 per cent would be required to stabilize concentrations at their current levels (Watson et al. 1990). The IPCC Supplementary Report noted some evidence that the rate of growth in CH4 concentration in the atmosphere may be already beginning to slow down (Houghton 1992). Even with this, however, potential feedbacks working through such elements as soil moisture levels and rising high latitude temperatures, could result in significant increases in future CH4 emissions. All of these trends suggest that CH4 will continue to contribute to the enhancement of the greenhouse effect well into the future. that there are sources yet to be identified (Watson et al. 1990). As a result the global N2O budget remains poorly understood, and its future concentration is therefore difficult to predict. 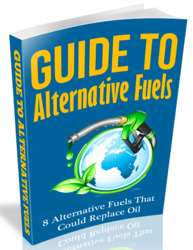 CFCs (see Chapter 6) are aimed at preventing further damage to the ozone layer, but they will also have some impact on the greenhouse effect. However, CFCs have a long residence time in the atmosphere—up to 400 years in the case of CFC-13 and CFC-115—and even as emission rates fall, they will continue to contribute to global warming for some time to come. The presence of these other greenhouse gases introduces a number of uncertainties into the predictions of future greenhouse levels. None of them is individually as important as CO2. It has been suggested, however, that their combined influence on the greenhouse effect is already equivalent to half that of CO2 alone (Bolle et al. 1986), and by early next century their contribution to global warming could be equal to that of CO2 (Ramanathan et al. 1985). Their impact would become increasingly important in the low CO2 emission scenarios envisaged by some investigators. The involvement of the CFCs and N2O in the depletion of the ozone layer adds a further complication. Attempts to mitigate the effects of these gases on the ozone layer would also impact on the greenhouse effect. 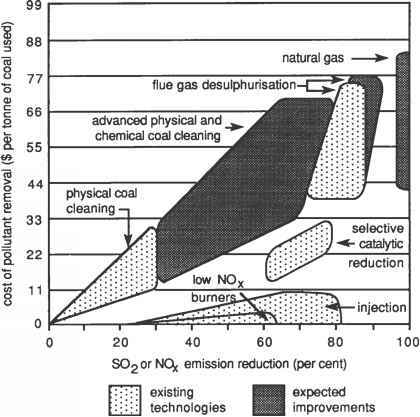 Thus, although such gases as CH4, N2O and the CFCs have received much less attention than CO2 in the past, it is clear that plans developed to deal with global warming must include consideration of all the greenhouse gases, not just CO2 (see Figure 7.10).